Why do we get a thrill out of horror films? And what's the deal with poisoned trick-or-treat candy? Those are a couple of the subjects in the Halloween edition of the Mental Floss show Scatterbrained. You'll also hear about a scientist who did research on trick-or-treaters, the inspirations for Stephen King novels, and a 1992 British TV hoax that terrified the audience. It's a reliable sign of autumn in the modern world. 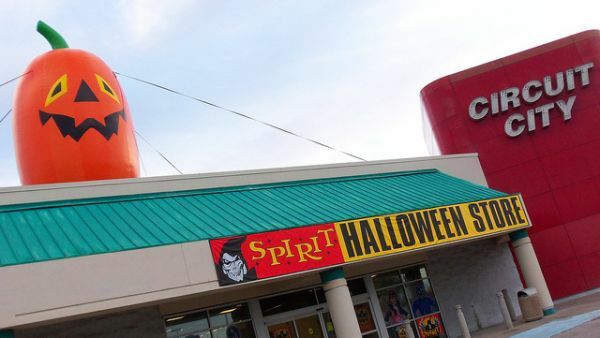 As soon as school starts, a Halloween store will suddenly appear somewhere in town. It stays open for a couple of months, and then closes early in November. It will be back next year, but not necessarily in the same place. How do they manage to do that? All of this would be impossible without the existence of vacant retail properties in need of tenants, even if those tenants only plan on being there for a few weeks. What’s bad for retail is good for Halloween pop-ups, at least to a point. These companies need vacant spaces to fill, but they also need nearby stores to draw in consumers. Strip-mall vacancies rose to 11.1 percent during the recession, according to CityLab — not great for retailers but a huge opportunity for Halloween pop-ups. “During the crash, I would get calls before this Halloween to ask if I wanted space for next Halloween,” the anonymous Halloween express agent told the website. Once the economy started to improve, there were fewer empty storefronts to select from, but this year, Halloween pop-up stores have plenty of Toy R Us space to lease. Next year, maybe Sears. Meanwhile, Halloween store companies will be working on inventory, staffing, and holiday trends in addition to locations for next year. Read about the Halloween pop-up store business model at Vox. Comedian David Lopez imagined the movie Halloween as if it happened in his house. Michael Meyers is no match for... well, just watch it. Bonus comedy if you are bilingual. This year, he produced the sequel. There's an AT-AT in the Front Yard! Halloween decorations come in all flavors, and aren't necessarily related to the classic monsters of horror films and folklore. Star Wars fan William Plessinger built a 17-foot-tall AT-AT for Halloween last year. This year, the improved version again graces his front yard in Columbus, Ohio. See more pictures of it at Facebook, and see a news report about the AT-AT at Laughing Squid. Plessinger did the interview dressed as a stormtrooper, more or less. 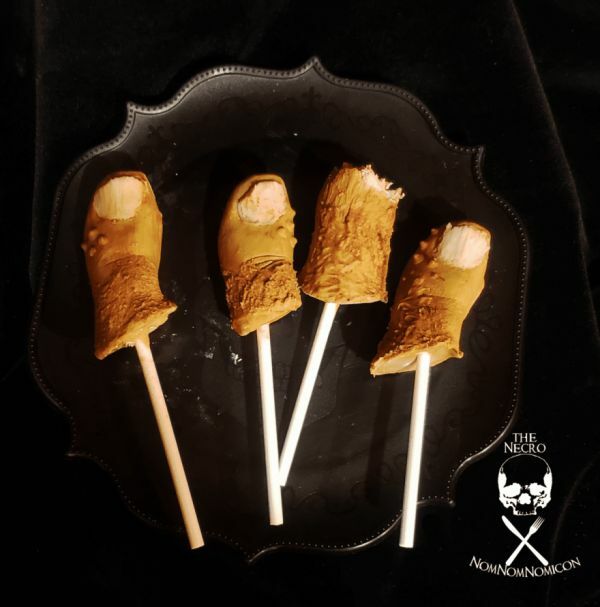 Hellen Die of Eat the Dead (formerly the Necro NomNomNomicon) celebrates the 25th anniversary of the movie Hocus Pocus with a recipe. In one scene in the film, Winifred Sanderson is working on whipping up a batch of her famous potion, with Mary and Sarah Sanderson helping her out. One of the critical ingredients is a dead man’s toe. Mary drops one in, but not before Sarah helps herself to a few to snack on. After trying a few, Die decided to make hers out of chocolate instead. On a stick. There's something rather appealing about a recipe that starts with "wash your feet," even if you don't plan to make these treats yourself. All the instructions for Chocolate Dead Man's Toes are at Eat the Dead. There's also a roundup of posts from elsewhere about the movie Hocus Pocus. 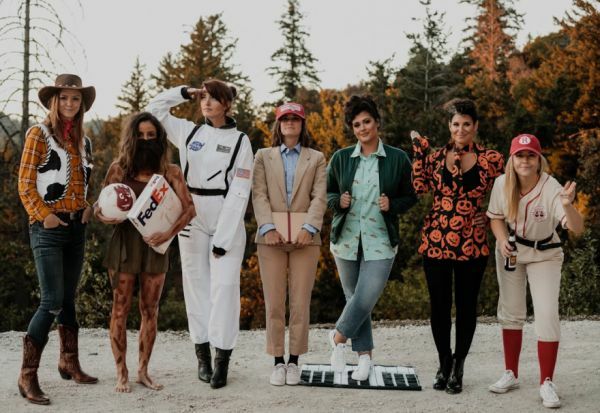 Every year (except 2017), redditor aubra_cadabra and her friends do a group costume for Halloween, focusing on the roles of one versatile actor. They've done Bill Murray, Robin Williams, Will Ferrell, Jim Carey, and Johnny Depp. This year, they chose Tom Hanks. The movies represented are, from the left, Toy Story, Castaway, Apollo 13, Forrest Gump, Big, David S. Pumpkins from Saturday Night Live, and A League of Their Own. 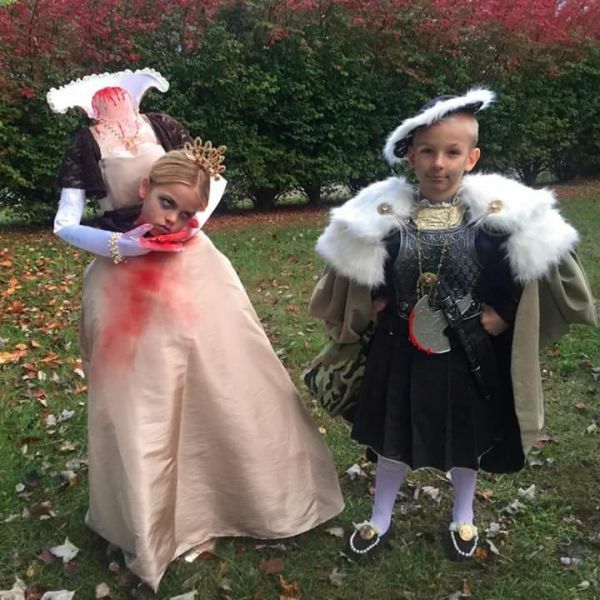 When redditor Monkeygruven posted this picture of some family friends ready for trick-or-treat, others bemoaned that the kids didn't pick their own costumes, nor did they know who they were portraying. Maybe it was more like this. Mom: Do you want to wear a scary costume or a princess costume? Mom: You can be both! You can be a queen who got her head cut off! Girl: Yeah, let's do that! Boy: I want to have my head cut off! Mom: How about you be the king that murdered her? Boy: Well, okay. But how will people know I did it? It had to happen sooner or later, considering how iconic the image is. 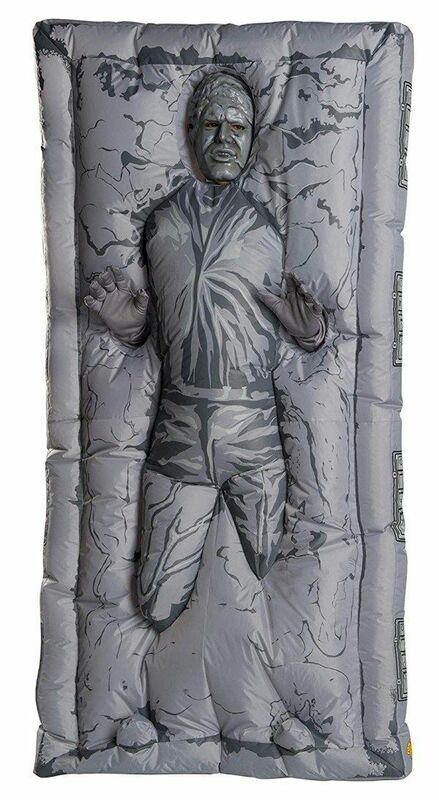 You can now buy an inflatable Halloween costume that makes you Han Solo frozen in carbonite! Entertainment Earth expects the costume to begin shipping some time this month, and you can pre-order it now for $60. That includes the inflatable, a fan, gloves, and a mask. It's up to you to provide a friend to help you through doors and hand your drink to you. See a diagram of how the costume works at Boing Boing. 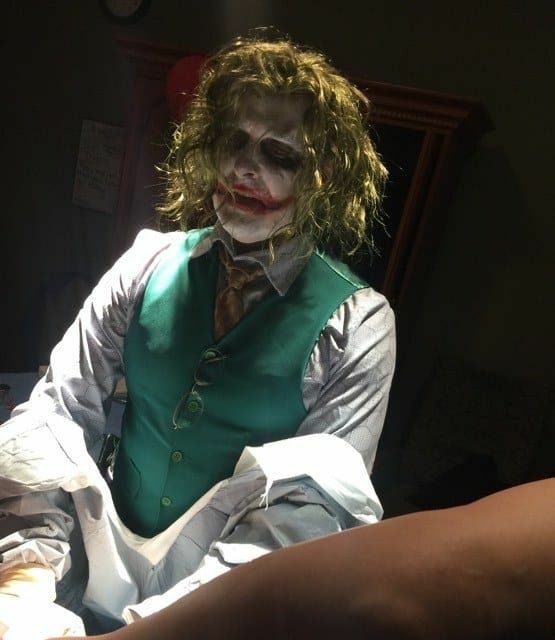 You thought the Joker was disguised as a nurse, but for Halloween, he was an obstetrician! Brittany Selph and her husband Justin went to the hospital in Paris, Tennessee, on Halloween because Brittany was in labor. Her doctor, Paul Locus, was dressed as the Joker and left for a while to hand out Halloween candy. He was still in costume when he returned to the hospital in time to deliver their little girl Oaklyn at 8:20 that evening. "When [Locus] came in our room the following morning, in normal doctor attire, he said, 'Sorry I couldn't make it in last night, glad to see the delivery went well'," said Justin. "He was a great sport about it all." I saw this picture yesterday at reddit, and at that time almost everyone said it was staged. So many redditors assumed that childbirth in a hospital is a sterile procedure, with mandatory scrubbing and masks. That's only necessary for surgery. See more pictures of Oaklyn's first Halloween at Buzzfeed. Imagine walking on the street in New York and seeing Luke Skywalker and Princess Leia driving by in one of those levitating speeder bikes from Return of the Jedi! YouTuber Jesse Wellens (previously at Neatorama) and model Carmella Rose took a ride around New York in their Star Wars Halloween costumes and delighted everyone with their speeder bike. Regimas and his girlfriend are cosplayers. 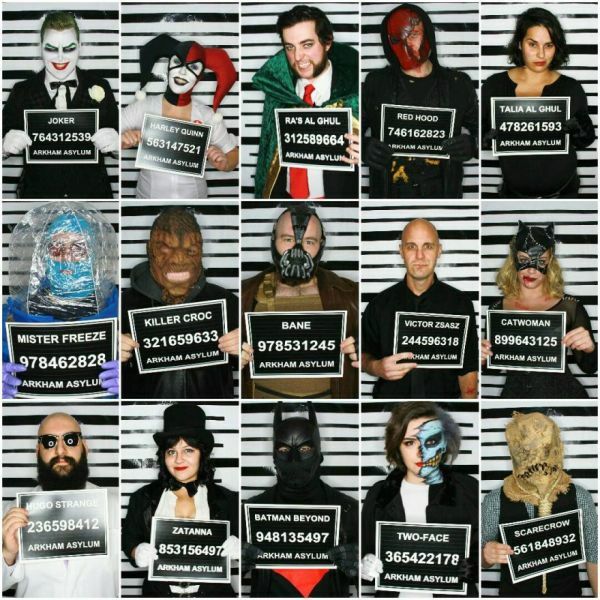 They host a Batman Halloween party every year, and this year's theme was Arkham Asylum. They had everyone dress as a different character from the Batman universe. All the guests went the extra mile with their costumes! Alright time for some explanation, people claimed their own characters and it was first come first serve, my girlfriend and I are cosplayers so people came to us for tips and stuff but they all made their own costumes. Then we printed the signs from the guest list and handed them out upon entry and took a photo with a DSLR. We were just as blown away as you guys are the with all the effort they put in. 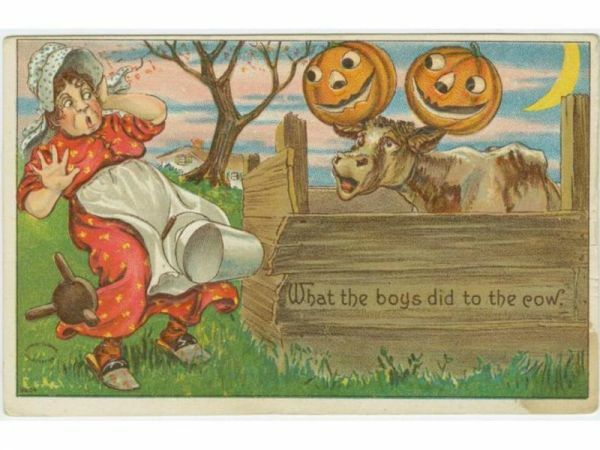 The "trick" part of trick-or-treat has almost been forgotten these days. The typical Halloween greeting we use to ask for candy is indeed a threat, but one that children don't take seriously these days. However, before World War II, Halloween mischief was serious and rampant. When these things happened in small towns, it was fairly easy for adults to figure out who did it. They either gave the miscreants a good dressing-down and made them repair the damage, or else they sighed and were thankful it was only one night a year. But the urbanization of America meant that strangers were living close together, and people did not feel like putting up with property damage and vandalism anymore. Read about the many efforts to turn Halloween away from tricks and toward treats at Smithsonian. Scarlette Tipton is three years old. 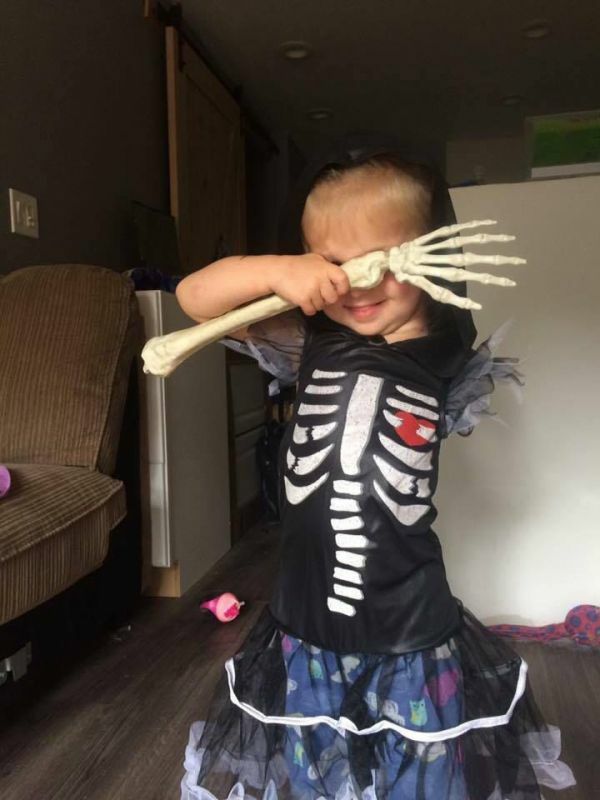 Her family celebrates Halloween in a big way, and Scarlette gets as many costumes as her imagination can handle. See, Scarlette's left arm was amputated when she was less than a year old due to cancer. She's in remission now, and her mother Simone Tipton is teaching her to embrace her difference. 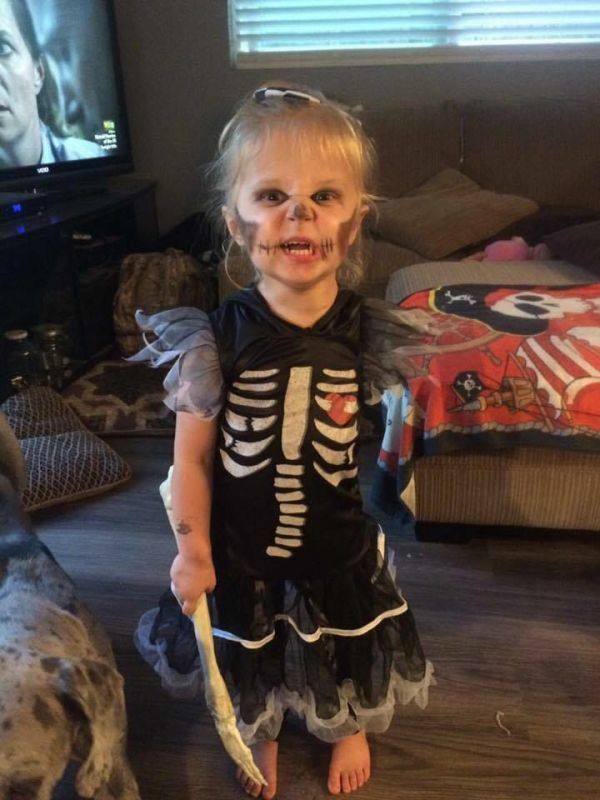 Tipton told Mashable, "We just want to make Halloween extra special for her. It’s my husband and I’s favorite holiday and she had her amputation the day before her first Halloween. She spent it intubated, on all kinds of pain meds, but she was a survivor! So now Halloween means something more to us." See more of Scarlette at Mashable.